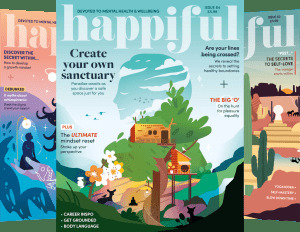 Mental health campaigners Jonny Benjamin and Neil Benjamin have opened up to Happiful Magazine, on how men can take better care of themselves and their friends. Jonny and Neil met ten years ago, when Neil asked Jonny if he was ok, after seeing him sat edge of Waterloo Bridge. Their encounter, documented in Jonny’s book, The Stranger on The Bridge:My Journey From Despair To Hope prevented Jonny from completing suicide and changed both of their lives. They were reunited in 2014 and since then, have championed mental health together, taken up ambassadorial roles, met royalty and run the London Marathon for the charitable initiative Heads Together. And it appears that it’s both their shared and separate experiences that make Jonny and Neil a strong unit when it comes to raising mental health awareness. During the conversation with the Mind Media Award nominated publication Happiful Magazine, Jonny drew attention to the importance of Neil’s role in particular, saying: “Neil is very honest when he speaks [about the conversation on the bridge he says he wasn’t an expert and just went with his gut instinct, and asked questions. Jonny and Neil are now embarking on new projects, continuing to widen discussions around mental ill health, starting with This Can Happen, a conference on 20 November in London addressing mental health in the workplace. On a larger scale, they have set up a charity - Beyond Shame, Beyond Stigma. Its goal is to ensure mental health can be discussed as confidently as physical health - as the charity’s name would suggest, free of stigma and shame. Read more of Happiful's interview with Jonny Benjamin and Neil Laybourn in issue 19, on sale Thursday 18 October. For more information contact Amie Sparrow, PR Manager, at amie.sparrow@happiful.com or call 01276 580030. Amie is the PR Manager for Happiful and Memiah, and a contributing writer for Happiful. Promoting a healthier, happier society by nurturing ideas, growing businesses and bringing people together. If you would like to ask us any questions or email us your comments please do, we will get back to you as soon as possible. At Memiah we are always looking to improve our social responsibility, we have partnered with the following organisations to make positive changes to the communities we work in. We’re on a mission to create a healthier, happier, more sustainable society. Our aim is to provide informative, inspiring and topical stories about mental health and wellbeing.